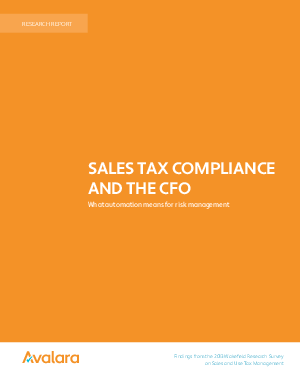 Sales tax compliance and the CFO: What automation means for risk management conveys why it’s time C-level executives should take a closer look at how sales tax is managed within their organizations. This report highlights what finance and accounting professionals know (and don’t know) about managing sales tax, and more importantly, why risk of non-compliance is more important in this legislative climate. This report draws upon a recent study by Wakefield Research, which investigates what leading and emerging companies in the U.S. know about sales tax compliance — and, more importantly — what the accounting and finance professionals in the trenches are doing to safeguard their organizations from potential audits and accounting pitfalls.